It's Friday and time for another Polkadoodle Challenge! This is my (Ruth) last week for setting the challenges and I hope you've enjoyed them! This was a really tough week for the DT to pick our top threes - a lot of entries and some stunning ideas so thank you all for joining in! I'd have picked you all, but sadly we can only pick three! Congratulations to our winners and please contact Nikky for your blinkies. Don't forget that there is still time to enter challenge 18 - DIY flowers as it is open until noon on Sunday 27 September. Basically, they could pick any Polly or Jack image from the Polkadoodles range but they had to colour it themselves, using what ever techniques or medium they wanted. Just before this post you will find two tutorials on digi colouring - one using felt tips (yes, remember those?!) and one using watercolour pencils. I hope the following samples will provide you with plenty of inspiration! 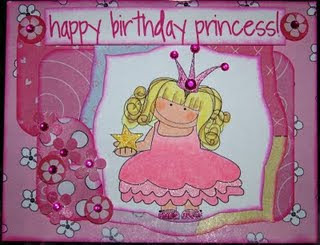 Boni has created a wonderfully pink princess Polly card! The image is from Jingle Jangle Christmas but as you can see, can be adapted to suit any occassion! Backing papers are from Candy Doodles. 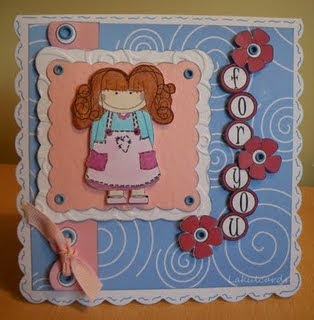 Claire has used papers from Candy Doodles and added Polly from Sugar Birdies. She's coloured Polly with copics and a little Sukra stardust. Great way of adding an image to a double fold card! Enfys has created a spooky but sweet Halloween card using elements from the download - both Polly and Marmalade are from the collection. I do like the drippiness of the frame and how Polly seems to be menacingly glowing! And here is another spooky Halloween card this time from Kath! A glittery spiders web taken from the Halloween download along with Polly who has been coloured using watercolour pencils and her most favourite brush! Kerry has used Sugar Birdies papers and Polly is also from the cd. 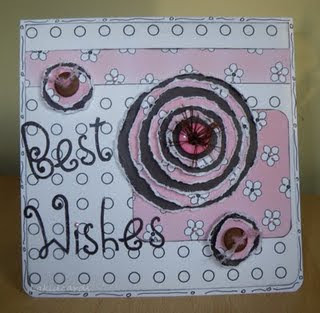 With some subtle embossing and eyelets (I do like eyelets - they are very underated in my opinion) this is a great card. Now I'm hungry! Kris has coloured Jack with Prismas and OMS with the sentiments being computer generated. Now I do like funny cards and this one made me laugh out loud! Kris has used the Halloween download and also Candy Doodles. Saskia has created a very cute Christmas card using the elements from Jingle Jangle Christmas - the holly stamps are from the rubber stamp collection. Polly (lets hope she doens't lean too hard on the gift!) is coloured with copics. I've used the Halloween download for both my samples - a tutorial for each card precedes this post so if you want to know more, scroll down! Polly has been coloured with watercolour pencils and Jack with felt tips. Both cards have a little wobbly eyed fimo spider attached! Hope you've enjoyed the challenge for this week and we all look forward to seeing your creations! Just simply leave a comment on this post with a direct link to your blog post. You have until Sunday 4 October at 12 noon GMT to enter. **Edited to add: Any digi image is fine but would love it if a Polkadoodle one was used! And here is the second tutorial to accompany this weeks challenge! My equipment is very basic! These are the watercolour pencils (24) that I use and also the brush felt tips (30). The watercolour pencils can be used as ordinary pencils, but they really come to life when a tiny bit of water is added. For this tutorial I am colouring Polly Polkadoodle from the Halloween download. I've started with a light and pale layer of colour. I've now added more definition to Polly's hat by dipping the nib of my pencil into water - I can now spread the colour more easily and also choose which areas I want to leave as highlights. To build up more intense and darker colours, I've used not only the blues but also greens and purples. I would not use the black at this point as to go too dark too quickly may spoil the overall effect. The same technique is then applied to her cape. Colour is built up slowly with greens, browns, blues and reds. Other smaller areas are now coloured. And only now (below) have I added a tiny bit of black here and there to provide a darker contrast to the colour. However, it is really the colour and it's depth that I want to portray which I feel provides a richer and deeper colour than using black as this can be a very flat tone. And here are the two images together that I coloured for these tutorials. Same technique applied to both images but different results due to the medium used. 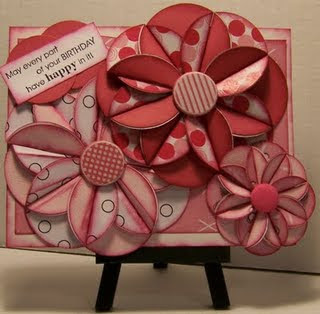 And this is the card I made with the Polly Polkadoodle image. 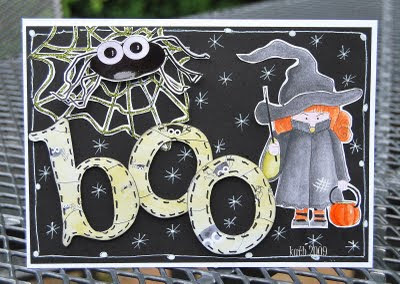 Papers are also from the Halloween download and the little fimo spider is made by me! Hope you've enjoyed the tutorials and that you'll be able to join in with the challenge this week! Here is a tutorial to accompany this weeks challenge. There will be another tutorial published just after this one which uses a different medium to colour a digital image. My equipment is very basic! These are the watercolour pencils (24) that I use and also the brush felt tips (30). I use the brush felt tips as the hard nibbed ones tend to 'scuff' the paper and are not as easy to blend with the different shades. My two images that I'm colouring - Jack and Polly Polkadoodle from the Halloween download. I've started off with Jack and the felt tips. By using a pale blue felt tip, I've coloured his jeans. This is now my base colour upon which I will add darker colours for shadowing. I've then 'dotted' darker shades of blue on top of the initial block of colour - this is now providing shadows and form and it also helps to stop some of the hard lines that you get when using felt tips as they don't blend too well, but with this technique, its not quite as noticeable. Once the jeans are completed I started on Jack's cape. Again, I added the lightest green I wanted as my base colour. And slowly built up the shadows - the paler green stays as the highlights. Once I'm happy with the cape, I then start on other smaller areas - I've coloured his t-shirt and started on his creepy gloves. Again, I've used the same techniques. I've started to add different colours such as purple, blues and reds to build up more definition and to extend my colour range. Next, the hair and mask is coloured. And for extra highlights, I've used a white gel pen and loosely but carefully scribbled over the top of the felt tip where I want highlights. This provides more definition. I had a little helper whilst I was colouring the two images - Samuel was on his school holidays and sat with me and coloured his own Halloween Jack with his felt tips! Even though I've enlarged the image to fit an A4 sheet, there is no loss of quality - so you can make the images as small or as large as you wish! 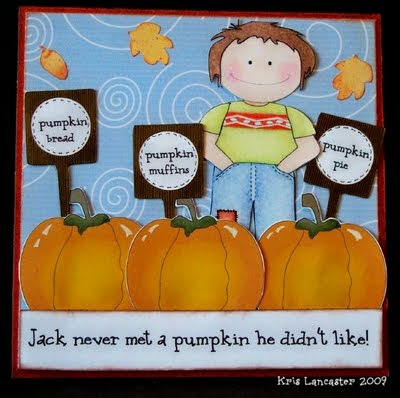 And this is the card I made with the image - I cut around Jack, leaving a fine white border and layered him onto papers from the Halloween download. A bit of inking and doodling and he is complete! Plus the wobbly eyed fimo spider, of course! Once again it is Friday! And another Polkadoodle Challenge! We had a great response to Challenge 17 last week which is still open until Sunday 20 September so you still have time to enter if you've not already done so! 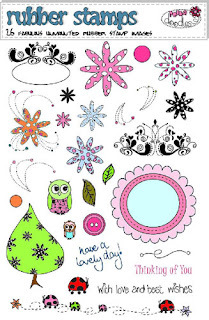 Did you see the launch of the Polkadoodle Rubber Stamps earlier in the week on Create and Craft? It was their world wide launch and they are very very limited in supply - to the extent that not all of the Design Team have got them. I've been very lucky and been able to play with both sets - one complements the Candy Doodles cd and the other one Jingle Jangle Christmas. You do get a lot for your money - the deeply etched rubber sheets are packed to the rafters with designs and although they work best with their cd's, they will look great on any contemporary or traditional project. The shows are repeated frequently on Create and Craft so hope you get to see them! Click here to go to the Polkadoodle shop to buy! The Design Team once again have made some stunning samples to get your creative juices flowing. Or should that be flowering? Bad joke, I know! Boni has created some wonderful flowers by cleverly folding shapes cut from Candy Doodles. I really like the way they overlap and crowd each other. Big blooms always work well on cards - bigger the better I say! Claire has been creative and has made her flowers with the brand new Polkadoodle Candy Doodle stamps! These really do look stunning stamped onto acetate, coloured, trimmed and added to the front of the card. Just look at this stunner from Kath! 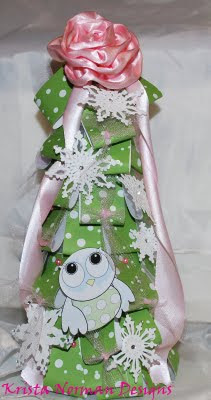 She has also used the brand new Polkadoodle Jingle Jangle Christmas stamps and papers from Jingle Jangle Christmas too. 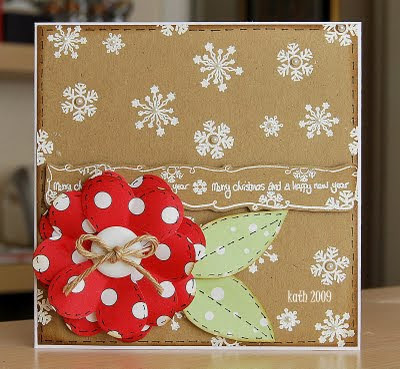 The snow white snowflakes look so festive stamped onto the pale brown background. Kath's flower is made from folded hearts - I really must give this technique a try! And from Kerry this week, not one but two cards! Both have been made using papers from Candy Doodles. 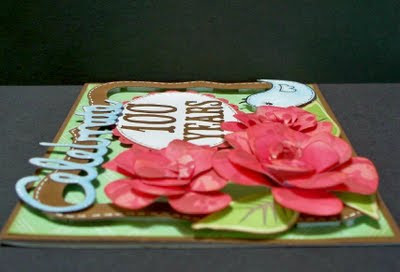 The top card uses a very similar technique to Kath's - the flower is made from hearts and the flower on the lower card is made from distressed circles layered to create dimension. Kris stunned us all with this creation! 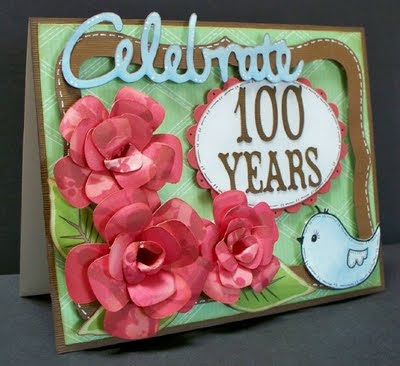 Made to celebrate her Grandmother's 100th Birthday in early October. Would you guess that the flowers are made from Jingle Jangle Christmas papers? They look so real and life like that I wish sometimes that my pc had smelly vision! The birdie is from the Sugar Birdies cd. A very Happy 100th Birthday to Kris' Grandma! Krista has created a wonderful paper folded Christmas tree by using Jingle Jangle Christmas papers and a ruched ribbon rose on the very top! The owl is also from Jingle Jangle Christmas and he looks like he's wondering how to fly to the top of the tree! Now this really does make me feel all cosy and wintery! Lulu has created her flowers by cutting individual petals, layering them and adding tiny fronds of curled wire - just stunning and such good colour combination! Made using Jingle Jangle Christmas. Nikky has come up trumps with this lovely touchy-touchy card! 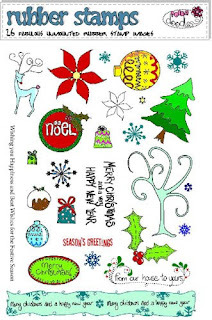 She's used papers from Jingle Jangle Christmas and the stamps are the brand new releases! The stamps are so versatile and just look how crisp and clean they stamp! Now this is one cute card from Saskia! 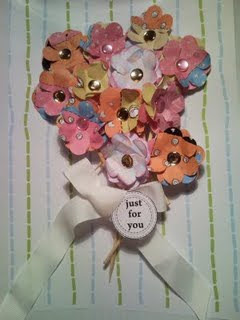 Made using elements from Jingle Jangle Christmas and her flowers are windmills! The two little presents and the sentiment you see are from the Polkadoodle rubber stamps - if you saw their launch earlier in the week on Create and Craft you'll know just how wonderful they are! The round card really lends itself to the snowy feel of this card! What a great bunch of flowers! Sue has created each individual flower by layering up and adding a central fastener to randomly cut scraps of Candy Doodles papers. At least this bunch of flowers will be longer lasting than shop bought ones! 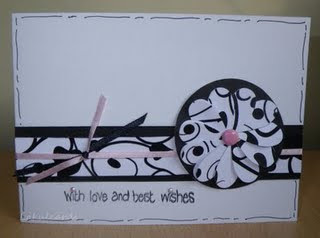 For my challenge card I made flowers using the dandelion collection from Candy Doodles. 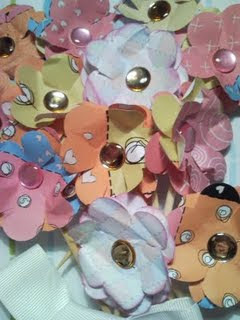 I've simply snipped parts away from a circle to create petals and then rolled the edges to make them 3d. The strands in the centre are curled strips of off cuts. A tutorial on how I made these flowers is immediately before this challenge post. I do hope you are able to play along this week - closing date is noon on Sunday 27 September - and all you have to do is leave a comment on this post along with a direct link to your creation so that the Design Team can pop over and have a look! Good luck and I'll see you next week for my final challenge of September - and I think you'll like it! A tutorial will also accompany the challenge and keep your eyes peeled for my little helper!